The contemporary design of the Lorenzi Collection is enhanced by the addition of the durable black or dark brown vinyl covering, that encases each piece in the collection. Painted grey hardware provides a distinct contrast to the finish of cover. Scaled for urban living, this collection will prove a unique and stylish addition to your master, youth, and guest bedrooms. 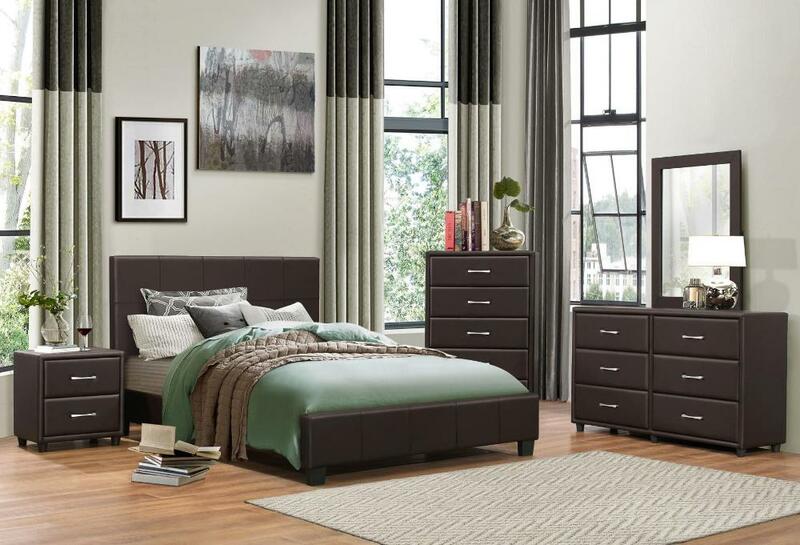 FEATURES: Black / Dark Brown Finishes ~ Contemporary Style ~ Bi-Cast Vinyl Upholstered Set ~ Grey Metal Hardware ~ Ball Bearing Side Glide Drawers.